if you're not one to head out into the middle of nowhere for these multi-stage weekends of music -- like me -- it's still interesting to check out the list of performers, with the simple intrigue of an old fashioned dance card. 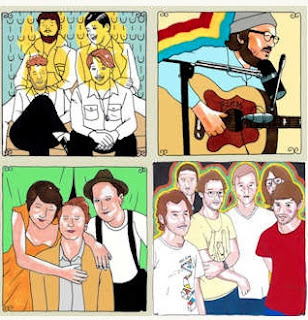 Similar to their Coachella 2012 Playlist, this over two hour compilation is created by Mr. Daytrotter, from their vast archives of stripped-down live sessions collected for the website. 41 songs fill the listening session, including indie stalwarts The National and Grizzly Bear, dream pop duo Beach House, psych rockers Tame Impala, plus folksy types such as The Lumineers and Mumford and Sons. Of course, there's plenty more where all this comes from, lurking in the full recordings with each band. If you're not a subscriber of Daytrotter, the two dollars monthly fee will certainly cover access to this playlist and much, much more. Link to listen here.